A decade ago, the 100 block of East Geer Street, a few miles from downtown Durham, was one of the least safe areas of the Bull City, due to drugs and high crime rates. Today, thanks in large part to Reinvestment Partners, what was once a dilapidated drug house on the block is now Sunshine Recovery Resource Center, a drug rehab center. The corner Express Mart now has fresh produce. The sidewalks have been repaved. There’s a food hub and professional offices. It’s the definition of urban revitalization. The crown jewel of the block is Inter-Faith Food Shuttle’s new Geer Street Learning Garden, an oasis of organic vegetable plants, flowers, and beehives, with an outdoor classroom to teach kids and adults about the health benefits of eating fresh, local food. The idea for the garden fell into place last year. Peter Skillern, the executive director of Reinvestment Partners, was not a gardener himself (“My sweet potatoes would come out looking like modern art,” he joked), but he was interested in having someone cultivate a garden in the lot next to his office building on East Geer Street. It seemed a perfect fit, since the Bull City Food Hub – also a project of Reinvestment Partners – was right across the street. The hub helps get local farm-fresh veggies to consumers, providing cool and cold storage for Durham businesses. 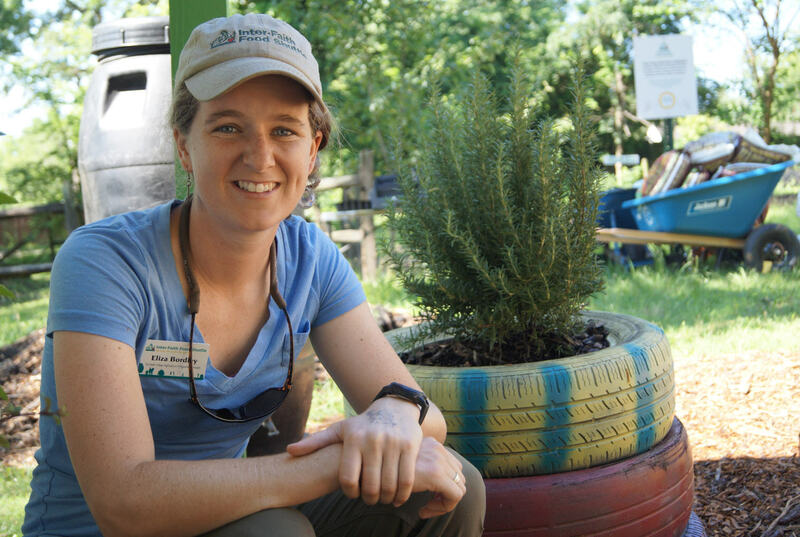 Skillern approached Eliza Bordley, Urban Agriculture Programs Manager with the Food Shuttle, who was already looking for a space like the Geer Street lot to replace the onsite Blue Cross and Blue Shield of North Carolina employee garden. Our employee garden wasn’t large enough to involve more than a fraction of the nearly 5,000 people of our workforce, and we were interested in making a bigger impact in the community. And that impact is indeed important; while our employee garden donated 72 pounds of fresh food last year, we anticipate donating at least 500 pounds of food from the new garden this year. We were honored and eager to provide funding to get the new garden started. So with the idea, the land, and the funding all in place, the garden got underway this spring. The food grown at the Geer Street Learning Garden goes to participants of the Sunshine Recovery Resource Center down the road, and to local food pantries. When I visited the garden, they had recently harvested collards, swiss chard, sugar snap peas, carrots and fava beans – ideal ingredients for healthy meals. With the produce, the Food Shuttle’s Nutrition Education team provides recipe cards with nutritional info on the veggies and ideas on how to serve them. Because who knows what to do with fava beans? Eliza Bordley, Urban Agriculture Programs Manager with the Food Shuttle. Junior Master Gardeners: A semester-long program for elementary school students within a three-mile radius of the garden. Right now she’s working with a few Durham schools where 100 percent of the kids qualify for free or reduced-price lunches. Seed 2 Supper: A six-week program teaching low-income families how to garden at home. Production Assistant Internship: A six-week, 20 hours/week paid internship for a high school student from Partners for Youth Opportunity. Public Workshops and Workdays: Every Wednesday and two Saturdays each month, year-round. Bordley says there’s something for everyone in these events. She even had a group of ladies wearing heels volunteering in the garden recently. “They were awesome,” she said. One thing I love about the garden is that it’s a conglomeration of Triangle-area nonprofits and businesses that are all doing tremendous work. Reinvestment Partners leases the garden’s land to IFFS, for free. Burt’s Bees Greater Good Foundation donates funds for the “pollinator” portion of the garden. TROSA mows the grass and keeps the lot tidy. 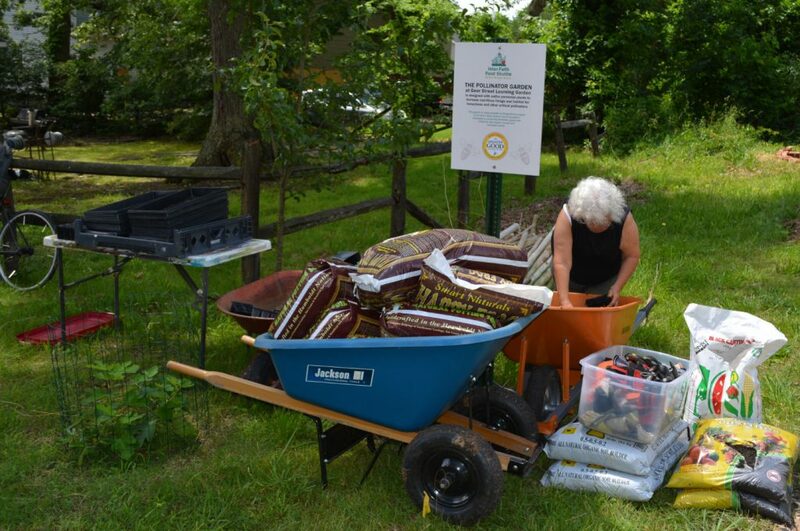 Tilthy Rich Compost Service provides the garden with soil. Bee Downtown is managing the garden’s beehives. The garden’s produce is stored at the Bull City Cool food hub. Skillern from Reinvestment Partners likens the community partnerships working together on this block of East Geer Street to “making a big pot of stone soup. Everyone brings a unique set of skill sets for the greater good.” Perhaps it’s stone soup with fava beans. And another integral ingredient of that “stone soup” is the community’s children. The garden has a salsa row and a pizza row, where children can make a tangible connection to how food growing in the ground gets onto the plate. Bordley loves working with kids in the garden: “If a kid is stoked about gardening and healthy food, then their parents will get that way, too.” She’s seen adults who were afraid to try a new food – like swiss chard – but they’re willing to try it if their kids are into it. The team prepares an activity for the local kids. Volunteer with Backpack Buddies. One of IFFS’s signature programs, Backpack Buddies provides children from food-insecure homes with weekend meals during the school year (in a backpack). You and your kids can pack backpacks at the Bull City Cool food hub, across from the Geer Street Learning Garden. Check out the garden at 110 East Geer Street in Durham. 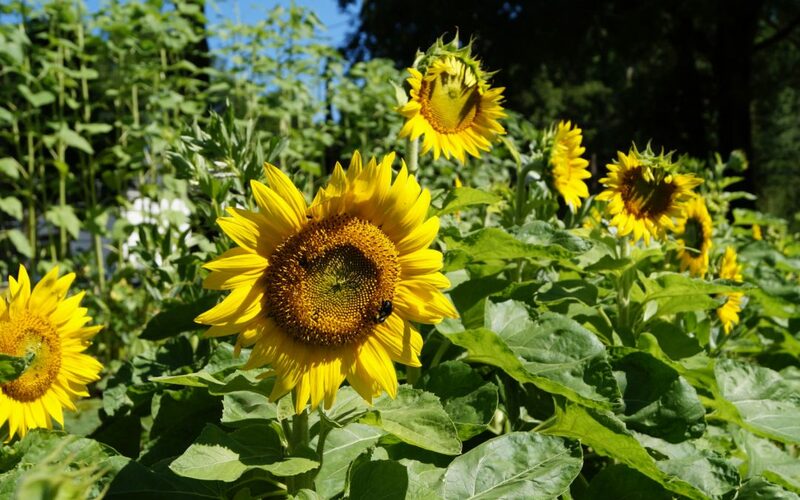 Right now sunflowers are blooming, the tomatoes are almost ripe, and the new beehives will soon be buzzing. It’s peaceful and colorful, and every square inch is tended to with the greatest care. It’s a garden made from big ideas, generosity, and a caring community.